The truth is that we are at an age now where we have to hire out some of the maintenance projects around the homestead. This is hard to do financially but I do not feel that we can risk Gene falling off of the roof and breaking a bone. Especially not during our busiest “spring rush” time of year! If Gene were to get injured everything from his heavy lifting to lawn mowing would end right now. Just not worth it. This is one of the on-going challenges of senior homesteading. And to complicate things, Gene is suffering from either a pulled muscle or a hernia so he is not at his peak right now we well. His going up on the roof did seem like a smart decision currently. The studio building has moss on the roof. icitated or needs surgery; we could be in huge trouble here. We have no family nearby that can pitch in to help and hiring a local handyman or helper for day-to-day work is next to impossible here. Staying able, fit and capable of keeping the homestead up is serious business when you are a senior homesteader. This week we hired a contractor to help us with two roof related projects. The first project was spraying the roof moss on the studio building. 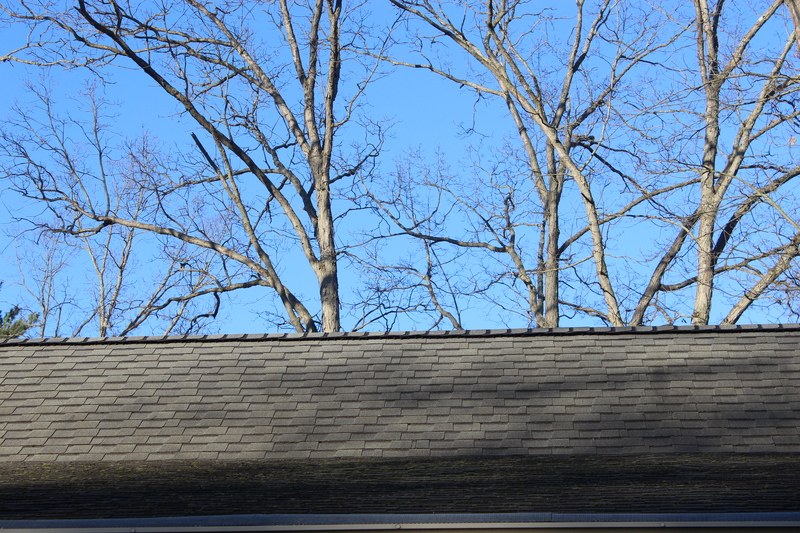 I noticed last fall that this roof was green with moss and I got busy researching and talking to contractors about what to do about it. The word was, “Take care of it now or it will affect the life span of your roof.” So that project was added to our maintenance list. 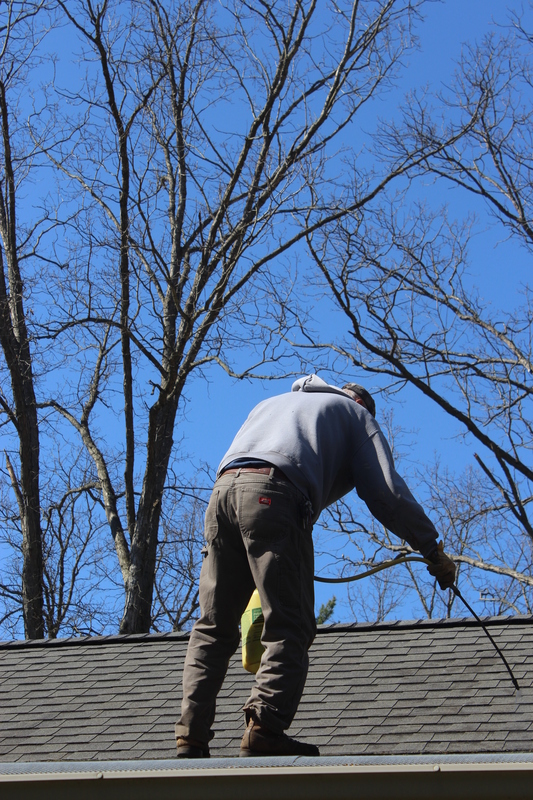 Our goal is to kill off the roof moss and to stop it from re-growing and ruining our roof. I looked at several options; one option contained bleach, the second Wet & Forget was the least toxic and caustic and The Stainhandler product is caustic. I can see using this on an old pole barn for example but not on my 10-year-old, well maintained studio building with beautiful landscaping surrounding it. So we decided to try Wet & Forget first www.wetandforget.com/product_wet_and_forget_outdoor.html and are crossing our fingers that it works for us. Wet and Forget is a concentrated product that is designed to attack mold, mildew and remove stains from the roof. It is non caustic, non acidic and contains no bleach. This does mean you have to repeat using it from time to time, but that is a trade-off I am willing to make. Wet & Forget is an easy to use, one-step product that does not require, scrubbing, rinsing or power washing. You dilute it according to the directions, spray it on your roof with a garden sprayer and you are done. I read the reviews and most of them were positive. Frank the contractor spraying the Wet & Forget on the roof. Wet and Forget has a unique combination of biodegradable selective surfactants for moss, mold and mildew stain removal on any exterior surface. When diluted with water and applied, it immediately penetrates the unsightly stain. Each time it rains, this safe, cleansing combination reactivates to gently lift the moss, mold and mildew stain without damaging the surface. Wet and Forget is an EPA approved one step process that requires no scrubbing or rinsing. It is non-acidic, non-caustic and contains no bleach. Be patient, Wet and Forget’s gentle cleaning action takes time depending on how heavy the stain is and results are visible over time. Remember good things take time, and Wet and Forget continues to clean for up to a year. No special equipment is required. Just apply Wet and Forget with a pump-up garden sprayer. After the first application simply reapply Wet and Forget at the first sign of moss, mold and mildew stains returning. Wet and Forget can be used on any outdoor surface. Some examples of these surfaces are: asphalt (black top), Astroturf, aluminum siding, awnings, brick pavers, composite decking, concrete, driveways, docks, fiberglass boats, fiberglass shingles, fiberglass hulls/topsides, green houses, gutters, inflatable dinghies, limestone, marble, marinas, natural stone, outdoor furniture, outdoor planters, paint surfaces, patios, patio furniture, plastic houses, recreational vehicles, retaining walls, sails, sandstone, shade sails, sidewalks, stucco, tennis courts, teak decks, textured finishes, tiles, tombstones, umbrellas (outdoor), vinyl siding and wood. Our contractor said he used 6 gallons of this product for our roof putting three coats of it on the roof. He kept waiting to see a change but it did not so he put on another coat! Now we wait and pray that it does not rain for a few days! Project 02 was to attempt to seal the leaks in our homes eves and gutter system. We have about a dozen leaks that required buckets under them and constant watching and emptying of the 5-gallon buckets. We put a new roof on our home in the fall of 2016 so this roof is sound and this leaking issue is not dangerous, but more annoying than anything. Every homeowner has an ongoing issue around their homestead and ours has been water…and after trying to get this leaking resolved for over four years, I wanted this fixed and fixed now. Streaks are a tell-tale sign that moss is on the way. The locals here tell me that eve and gutters is the leading cause of ice damns here in snow county. Roofing experts tell me it is because these houses do not have enough ventilation or insulation (or both) in their attics. We have had serious issues with ice dam here for years, so we have added them both; insulation in the attic, ventilation around the perimeter of the house and when we had the roof replaced in the fall of 2014 we added a long roof vent system. All of these changes have improved the ice dam and huge dripping ice cycles we have long experienced here. 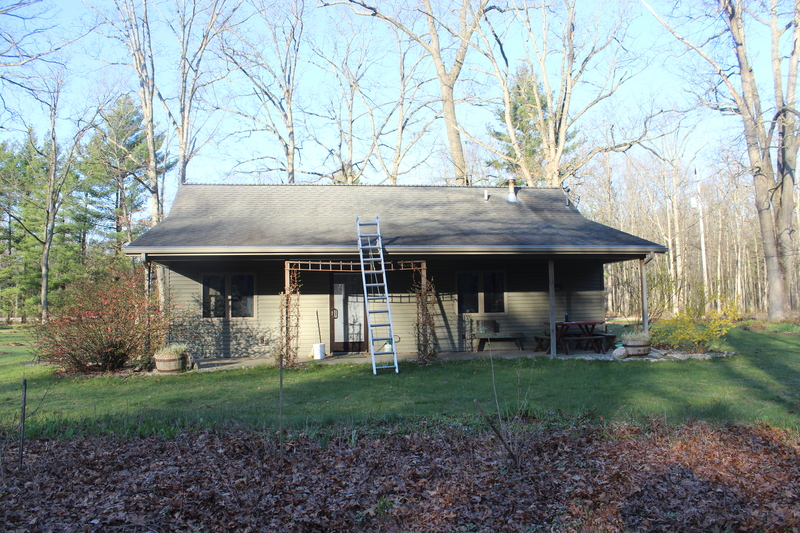 Although it is not common practice to put eves and gutter on houses here in our area we needed to keep the water off of the limestone siding of our home and from around our foundation. When we moved here there was a lot of moss growing right on the stone siding and I could see that water was running right down the siding and splashing up onto the stones and onto the foundation of our home. That was not a good thing. We stated by scrubbing that moss off of the siding, adding seamless eves and gutters and I designed the landscaping around our home so the water would flow away from the foundation and off and down the lawn. But the water flow problem off of our roof has been a fifteen year issue and specifically ice dam on the roof and leaking eves remained and are now an issue I hope we have conquered at last. The next big rain storm will tell. Next I am going to investigate stain protector zinc strips to help keep the black streaks and moss growth at bay as well.